This stunning piece of furniture is imported directly from Italy. The comfortable armchair is constructed of fine hardwood and given a creamy finish. 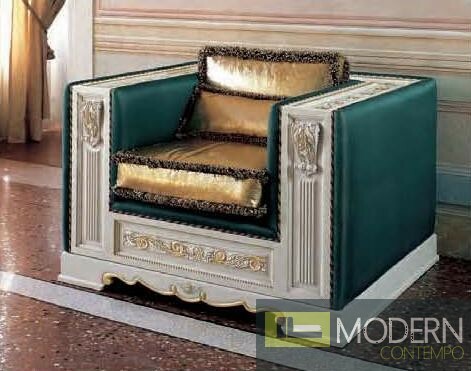 The sides are upholstered in sheen, dark green fabric and the cushions are upholstered in gold. The gold accenting and wood detailing throughout this piece bring it all together & give it an exemplary, European style. W48.8" x D40.9" x H30.9"